Gefen CAB-DVIFO-60MM is an active 66 foot long male-to-male DVI-D fiber optic cable solution designed for reliable high performance 1080p HDTV (HDCP Compliant) and 1920 x 1200 PC video extension over long distance. 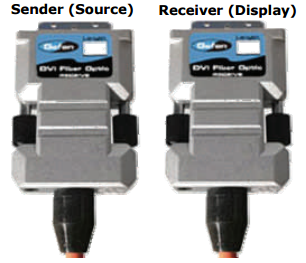 The Gefen DVI FO Fiber Optic Cable series integrates DVI connectors, fiber optic components, and the DDC / EDID signals into one compact cable that exceeds the performance of traditional copper- and silver-based cables by reducing EMI interference. When compared to traditional DVI Extenders, this integrated Fiber Optic DVI cable provides ease of installation, increased reliability by eliminating points-of-failure, and better performance by eliminating interference from interconnections. CAB-DVIFO-60MM can is powered via the included power supply connected to the receiver (If 5V is not present on the source computer, then an extra power supply - available separately - will need to be installed on the sender unit). HDTV Resolution Support: DVI FO Fiber Optic cables support resolutions up to 1080p (including: 1080i, 720p, 480p, 480i). HD Computer Resolution Support: DVI FO Fiber Optic cables support computer resolutions up to 1920x1200. Higher Performance: Exceeds the performance of traditional DVI Cables and DVI Extenders by reducing the EMI (Electromagnetic-Interference). Durable Design: Fungus-resistant, water resistant, and UV-resistant assembly that can meet the rigors of most installation and operating environments (*suitable for both indoor and outdoor use). Power Supply Included: The included power supply must be connected to the receiver unit to operate. The sender will receive power from the DVI port on the source computer. If 5V is not present on the source computer, then an extra power supply will need to be installed on the sender unit (available separately). HDCP Compliant: Fully supports High-bandwidth Digital Content Protection scheme for HDCP devices such as projectors, Blu-ray players, video game systems, and satellite TV boxes. 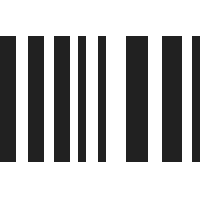 RoHS Compliant: Designed to restrict use of ten hazardous substances commonly used in electronic and electronic equipment, such as Lead, Mercury, and Cadmium. Per the vendor, all sales for this product are final; no returns accepted. Requires clearance of a 1.5" (3.81 cm) wide conduit. *Although the cable is suitable for both indoor and outdoor use (fungus-resistant, water-resistant and UV-resistant), the cable ends must be kept clear of moisture and contaminants. If dust/dirt contaminants are an issue, enclose the entire end connector in a plastic bag. Gefen DVI Extreme Fiber Optic Cables are not designed for permanent in-wall installation - Please Contact Us for an Extender to use in permanent in-wall installation. This cable is a replacement for the Gefen CAB-DVIC-DLBN-50MM, CAB-DVIC-DLBN-60MM, CAB-DVIC-DLB-60MM, and CAB-DVIC-DLB-50MM cables. The DVI FO DVI extension cables are robust assemblies that can meet the rigors of most installation and operating environments. Although outwardly similar in appearance to copper DVI cables, the DVI FO cable is made of glass optical fibers with complex electro-optical circuits embedded in the connector ends. If common sense handling is used in the deployment of the cable, then many years of fault-free operation can be anticipated. The following guidelines will assist in the installation and operation of the HDTV Extreme cable. Unlike a copper cable, the DVI FO cable is polarized - that is, the Sender end must be connected to the video source and the Receiver end must be attached to the video peripheral. The included power supply must be connected to the receiver unit to operate. The sender will receive power from the DVI port on the source computer. If 5V is not present on the source computer, then an extra power supply will need to be purchased and installed on the sender unit. Although the cable is suitable for both indoor and outdoor use (fungus-resistant, waterresistant and UV-resistant), the cable ends must be kept clear of moisture and contaminants. If dust/dirt contaminants are an issue, enclose the entire end connector in a plastic bag. The cable is durable and can withstand 1,500 impacts with a crush resistance of 1,800 N/cm with a flex resistance of 2,000 cycles. But it is not designed to be operated in an environment where continuous flexing is applied to the cable. The cable must not be subject to extreme bends during installation or while in operation. As a rule, the minimum bend diameter should be no less that 5" (13cm) - or in more familiar terms, the bend/curve of the cable should be no tighter than the outside perimeter of a standard Compact Disc (CD). During installation in conduit or through restrictive spaces, a minimum allowance of 1.75" x 0.75" (4.4cm x 1.9cm) for the end connector must be allowed. Be sure the Sender and Receiver connectors are clearly identified before installing the cable. During the pulling of cables, axial force must never be applied to the connector. Pulling must be done using a proper cable aid that applies the force along the jacket of the cable itself. Plastic boots must at a minimum be used to protect the DVI pins. If dust/dirt contaminants are an issue, enclose the entire end connector in a plastic bag. The operating temperature of the cable itself is -40° to +85°C (-40°F to +185°F), but the recommended operating temperature at each end of the cable assembly is 0°C to +50°C (+32°F to +122°F), not unlike the operating conditions of the equipment that is connected.